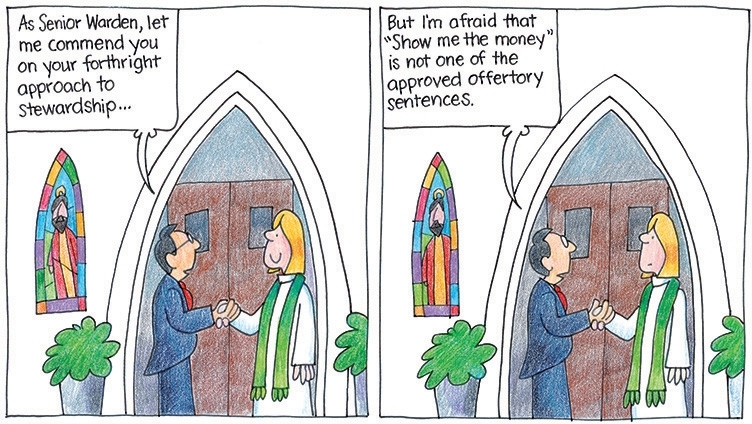 Cartoon from St. Swithin’s, by Jay Sidebotham, copyright © 2002 The Church Pension Fund. All Rights Reserved. Click here to see more. It’s Not Just About Money . . .
Do dollar signs go off in your head when you hear the “S” word—stewardship? Maybe you think about budget meetings or “passing the plate.” Or maybe you just have a vague idea it has something to do with money and churches are always asking for more of it. But stewardship is really a whole-life proposition. We acknowledge that God has given us everything we have and are—our time, our talents, our energies, our entire lives. Then we respond to those lavish gifts by using them for God’s glory, saying yes to God’s call to partner in God’s loving and reconciling work. 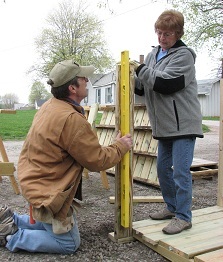 Building handicapped-accessible ramps for homes can be a form of stewardship. So can writing a newsletter, sweeping the church kitchen, visiting a sick friend, reading to children, or stockpiling crayons for a back-to-school drive. But material possessions are part of our lives too, and that’s where the budget meetings and offering plates come in. But Money’s a Part of It! Financial stewardship isn’t “giving to God”—everything belongs to God anyway. 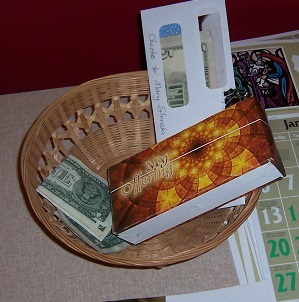 And we’re not “giving to support the church” the same way we would donate to public radio or the United Way. We give in thanksgiving for God’s lavish material gifts. We also give to honor the responsibility God has given us to take care of his people and his world. But we also give because there’s something about money that cuts right to the heart of who we are and what we need to be. Jesus said, “where your treasure is, there will your heart be also.” When we give of our “treasure,” something important happens in our hearts. The traditional model for stewardship calls for intentionally setting aside a tenth everything we have for God’s purposes. For many of us, that’s a goal rather than a current reality. And not all stewardship has to happen through the church—there are other avenues for supporting God’s work financially. But many of us have find that regular, planned, proportional giving through the church community makes a difference in our lives. Yes, it helps keep the lights on and pay the clergy. But more important, it helps keeps us honest, it draws us deeper into community life, and it increases our sense of being invested in what God is doing in the world. To learn more about how all this works at St. Stephen’s, click here.